Sid Lowe- "Fear and Loathing in La Liga"
As we are approaching the another “Clasico” next weekend, it is interesting that I read an excellent book on the rivalry between the two giants of European football, Sid Lowe's “Fear and Loathing in La Liga”. Football is politics. And in certain cases it can be beautiful both despite politics and because of politics. The classic clash between Barcelona and Real Madrid is one of these matches; every time they play is a guarantee of fantastic football and politics. Sid Lowe's book describes the history of this rivalry, both in political and in football terms, but mostly, how they both have mingled to create a rivalry that today is followed by the entire world. The rivalry is not only about historical facts, but also about myths: Barcelona sees itself as the righteous rebels against Franco's regime, while Real Madrid sees itself as a club of gentlemen and good football. But there are many more nuances to this history, as Sid Lowe so amply shows. For instance, during the civil war a Real Madrid president was in fact part of the anti-Franco Republican government, while Barcelona, after having competed during the civil war (contrary to Real Madrid, as the city was under siege), became the dominant team in Spain immediately after the war. Real Madrid was from the 1950s largely run by a pro-government president, Santiago Bernabeu, who led the way in making them the best team in the world in the 1960s, ahead of a Barcelona side that constantly saw a conspiracy behind Real Madrid's success. This is mostly showed by the myth that Alfredo Di Stefano was “stolen” from them, while it rather appears that they were less smart than Real Madrid in a complex negotiation involving clubs in Argentina and Colombia. The transition up to and after Franco's death is very interesting, when Johan Cruyff went to Barcelona as a player, and a new period of rivalry started. In football terms during the 1980s and 1990s the rivalry became the best in the world, with the best players in the world having played for either club. The list is simply amazing when one sees the players that have gone through either (or both in some cases! ): Paul Breitner, Gary Lineker, Hugo Sanchez, Diego Maradona, Ronaldo, Hristo Stoichkov, Emilio Butragueno, Michael Laudrup, Zinedine Zidane, Ronald Koeman, Raul, Romario, Luis Figo.... etc... The book has fantastic interviews with many of these players! In the 1990s Johan Cruyff, now as coach, set the foundation for what made the great Barcelona of the 2000s. In an attempt to be as good as FC Barcelona, Real Madrid's president, Florentino Perez, was instrumental in wanting to create a global brand spending millions on the best players in the world. In all, the 2000s became a period of rivalry defined by the best football in the world, money, and not least politics, as FC Barcelona continues to be an entry point of a growing Catalan nationalism demanding independence from Spain (the book starts with a highly politicized game of 2012 when thousands of fans in Barcelona shouted for independence during the match). In this regard, the clashes are as political as ever, but at the same time the match has become a global affair: the best footballers in the world facing one another in a match that is never insignificant, but a final every time. The teams are completely dominating in Spain, and their high class also makes them among the best teams in Europe (since 2000 Real Madrid and FC Barcelona have won three and four Champions League respectively) and surely in the world. Sid Lowe is an English journalist, and that gives the book strength, as he does not take sides in what is a rivalry full of bitterness and myths, something that is surely difficult. Many fanatical fans of either Real Madrid or Barcelona are probably not going to like the book as he tries to demystify some of their stories. In the end, one realizes that these two teams need one another. They would not be able to define themselves without that rivalry, which has surely pushed them to always be better, until now them being both the best. It is a perfect symbiosis of opposites that has given us some of the best football we can wish for. Any football fan should love this rivalry, and there is no better book to understand it. 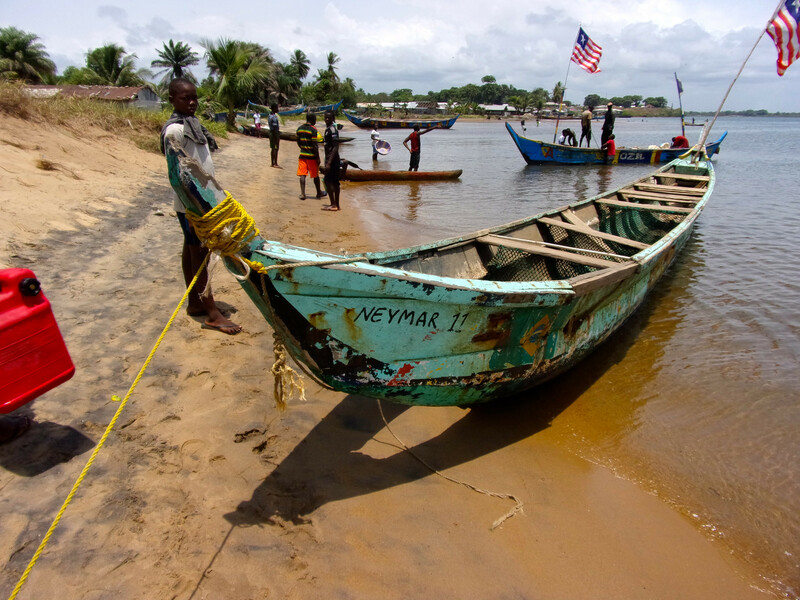 Football transcends borders, and in the small fishing village of Marshall, in Liberia, I came across a number of fishing boats with football names. Andres Iniesta and Neymar were two of the nicest boats, decorated with FC Barcelona and Brazil colours respectively, paying homage to these two great players. 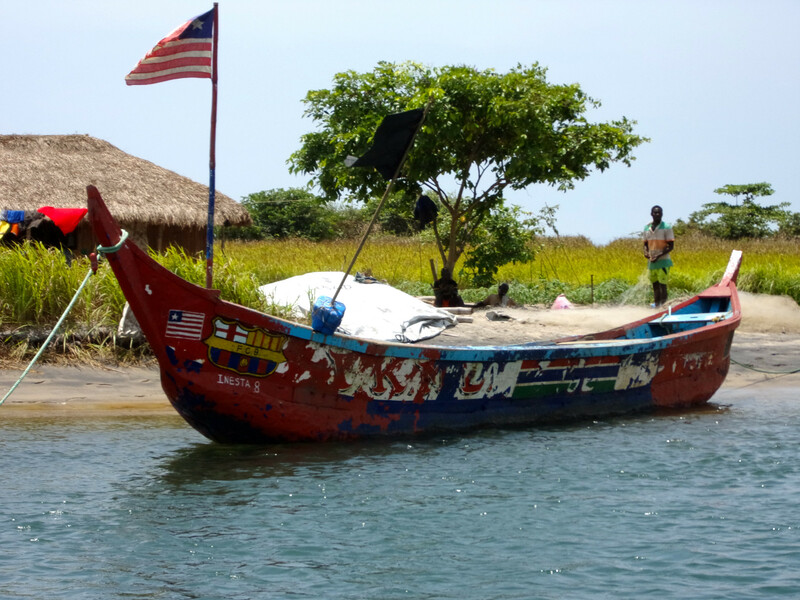 One boat also had the Chelsea logo on it. When I called him "Chelsea-man", all the other fishermen started laughing. Football transcends borders; and so does making fun of Chelsea. The USSR had made it to its fourth European championship final in 1988 when they lost to the Netherlands. It was thus the team that had played most Euro finals at the time, and was central to the entire history of the tournament. Four years later, the USSR had ceased to exist as historical events had changed the landscape in Europe. While the USSR had qualified in a group ahead of Italy, by the time the tournament started, the country had dissolved into 15 new countries. The solution would be either to let the second in the group in, or let USSR participate with the team that had qualified. UEFA opted for the latter option, and thus was born the “Community of Independent States” team, or CIS, a mixture of players from former USSR countries (dominated by Russia, but also players who came to play for Ukraine, Georgia and Belorussia). It was a side with excellent and experienced players, who had played in World Cups and European Championships, including the final four years before. After the opening of the USSR many of the players had gone to play in European clubs, so it was also a side with international experience. The captain of the team was Glasgow Ranger's Ukranian, Alexei Mikhailichenko. In defense his teammate in Glasgow, the veteran Oleh Kuznetsov, stood the two Spartak Moscow players Andrei Chernyshov and Kakhaber Tkhadadze. Sergei Aleinikov from Lecce and Igor Dobrovolski from Servette Geneve stood behind a powerful striking force with the young Manchester United star Andrei Kanchelskis, Benfica's Sergei Yuran, and the young Sergei Kiriakov from Dynamo Moscow. The CIS had started the tournament with a 1-1 with Germany and 0-0 with the Netherlands, and thus stood as favourites to progress before their last match against unfancied Scotland, who had started by losing both their first matches to the Netherlands and Germany, and were thus effectively out of the tournament. Scotland had qualified ahead of Switzerland, Romania and Bulgaria. The team captain was Richard Gough from Glasgow Rangers, and the side included such players as Brian McClair from Manchester United, Gary MacAllister from Leeds, as well as the striker Ally McCoist from Glasgow Rangers. But it were the Scottish, with only pride to play for, that were soon in the lead, when Paul MacStay, from Glasgow Celtic took a shot from outside. The flat but hard shot hit the post and bounced of goalkeeper Dmitri Kharin's head to make it a lucky 1-0 for Scotland. Barely ten minutes later Scotland got ahead 2-0 when Brian McClair shot from outside. His shot was deflected by Tkhadadze and cheated Kharin. Again somewhat lucky, but still 2-0. The CIS were shaken by the motivated Scots, but started dominating the match as the Scots pulled back. Sergei Yuran came close and Igor Dorbovolski and Igor Korneev were incredibly unlucky not to score in a double chance. Instead, with six minutes to go Scotland was awarded a penalty in a situation where Paul Nevin was clumsily brought down in the penalty area amid already defeated CIS defenders. Gary MacAllister did not miss, and Scotland went home with their heads held high, and took the CIS with them. With this, the CIS, or former USSR, ceased to exist as a footballing nation, as the players from this side went on to play for Russia, Belorussia, Ukraine and Georgia. Football is a reflection of society and history. On the football pitch, this match was an expression of the demise of the formerly great team of the USSR. Football is art, and great football is great art. And Johan Cruyff was indeed one of the greatest football artists the world has ever seen. His greatness went beyond his outstanding technical skills and physical qualities, but what made him one of the men that has changed football, was that he perhaps more than anybody else, was the first great footballer who “thought” football; who combined his skills and his brains to develop a whole new style of football. As a player he won three European Cups with Ajax Amsterdam, as well as la Liga and Copa del Rey with FC Barcelona. He also, more than any of the other immensely talented players of a great Dutch generation, symbolized the Total Football that took the Netherlands to two World Cup finals, and made them darlings of the world. As a manager he took all his skills to create a style of football that led FC Barcelona to four league titles in a row in the early 1990s, and FC Barcelona's first ever European Cup triumph in 1992. More than anyone else he created the foundation for the FC Barcelona style of today, meaning that not only Barcelona should be thankful, but also the Spanish national team, who would never have won the 2010 World Cup without that style. The Netherlands, Spain, and the entire football world should be sad with his parting, but at the same time thankful for everything he gave to the entire football world. An artist and a genius is joining Heaven's top League today. In the 1980s the USSR had one of the strongest teams in the world. The coach as the Ukranian Valery Lobanovsky, who had led Dynamo Kiev to become the dominant team in the USSR, as well as winning two European titles. In 1986 he took over as national team coach. His squad for 1988 included eleven players from Dynamo Kiev. Most notably were Igor Belanov, European player of the year in 1986, the dangerous striker with a hammering kick Oleg Protasov, the strong defenders Anatoliy Demyanenko and Oleg Kutznezov, as well as the elegant midfielders Vasiliy Rats and Aleksader Zavarov. The captain of the team was the legendary goalkeeper Rinat Dasaeev from Spartak Moscow, widely considered to be the best in the world. It was an awesome and physically strong side that functioned like a smooth collective. The Soviets had qualified in a difficult group ahead of East Germany and France. In the opening match of the Euro 1988 they faced the Netherlands. It was a strange match. The USSR dominated the midfield but the Dutch had many huge chances that were spectaculalry saved by an unpenetrable Dasaeev. In the end the USSR won on a goal by Vassiliy Rats. A tie with Ireland and a victory over England, gave them first spot in the group. In the semi-final the USSR were stronger than Italy in every respect, and won 2-0. In the final they would face the team they beat in their opening match, the Netherlands. The Dutch had grown during the tournament, and in spite of their opening defeat, they were favourites in the final.The had defeated England 3-1 and Ireland 1-0. In the semifinal they had defeated the home side of West Germany in a very dramatic match, and had all reason to be confident before the final. The stars of the team were AC Milan's star striker Marco Van Basten (who had scored the winner against West Germany), and the captain Ruud Gullit, also from AC Milan. They were complemented by a string of outstanding players: Zaragoza's Frank Riijkaard, PSV's Ronald Koeman, Barry Van Aerle and Gerald Vanenburg, as well as Mechelen's Erwin Koeman and Ajax's Jan Wouters. After defeating West Germany the Dutch had avenged the ghost of the final of 1974. Now, there was a second (albeit smaller) ghost to avenge, as they would be playing at Olympiastadium in Munich, the same place they had lost that 1974 final. Rinus Michels only made one change compared to the team that had faced the USSR in the first round: Erwin Koeman came on instead of John Van't Schip. The USSR was seriously weakened though, as two of their best defenders, Oleg Kuznetsov and Volodimir Bessonov, both from Dynamo Kiev, were both out on suspension. Instead, Litovchenko opted for a more massive and offensive midfield, but his change of Sergei Aleinikov, a midfielder, in place of Kuznetzov, seemed misplaced. Despite this, the first 20 minutes of the match the Soviets seemed to be more comfortable on the pitch, and Litovchenko had a good chance to put the Soviets ahead that was saved by Van Breukelen. After half an hour the Dutch seemed more comfortable and Ruud Gullit had an excellent free kick that was well saved by Dassaev. In the following corner kick a return ball landed with Erwin Koeman, who crossed to the far post. Van Basten had been told to stay at the far post, where Aleinikov did not pull forward for the off-side trap. Van Basten headed the ball into Gullit, in front of goal, who headed hard and brought the Dutch ahead 1-0. While a disappointment for the Soviets, they continued trying to go forward, and Igor Belanov had a huge chance in front of goal, but shot over the goalposts. The Soviets pushed forward in the second half. But ten minutes into the second half Marco Van Basten scored one of the most memorable and fantastic goals in European championship history. Arnold Muhren crossed from the left into the Soviet area. It was not a particularly good cross, sailing towards the back line. However, Marco Van Basten ruched towards it, and made the impossible shot: he first-timed the ball from a sharp angle, and the ball went spectacularly in behind a stunned Dassaev. Igor Belanov had a shot on the post not long after, but it did not seem they would be able to score. When Van Breukelen saved a penalty by Belanov, correcting his mistake that gave the penalty, it seemed that on this day the USSR had it all against them. The Netherlands won their first and highly deserved title with a team of fantastic players. The USSR had a great side but had been beaten by a better side. This was the last match the USSR, former champions, played in a European Championship: four years later the world would be changed, and the USSR would no longer exist. In 1988 the European Championships were held in West Germany, and there was no doubt that the Germans were favourites; they had come second in the 1986 World Cup and had a team of superstars that would go on to become world champions only two years later. At the same time the Netherlands, who after their greatness of the 1970s had not been at the top since, not playing the world cups of 1982 and 1986, nor qualifying for the Euro 1988. But the Dutch had nevertheless not stopped developing players in their great clubs. PSV Eindhoven had been the leading club who just a couple of weeks earlier had taken the European Champions title. The Netherlands star player, Ruud Gullit, had played for PSV before changing to AC Milan that same year. Ajax Amsterdam had also been able to develop a hugely talented generation that had won the European Cup Winner's Cup in 1987, with two notable players: Marco Van Basten, who had also changed to Ajax Amsterdam, and Frank Riijkaard, who was now playing for Zaragoza in Spain, but would eventually join his compatriots in AC Milan. The Dutch had qualified with style ahead of Greece, Hungary, Poland and Cyprus, but had started the tournament by losing their first match 0-1 to the USSR, a victory that could be creditted to Rinaat Dasaev on the Soviet goal. But two victories in the following two matches, 3-1 against England (with three goals by Van Basten) and 1-0 against Ireland, put the Netherlands in the semi-finals where they would face the winners of group A: West Germany. Coach Rinus Michels built his side based on a PSV defense, with Hans Van Breukelen on goal, and the solid Ronald Koeman, Barry Van Aerle, and complemented by Anderlecht's veteran, Adri van Tiggelen. The midfield revolved around Gullit and Frank Riijkaard, PSV's Gerald Vanenburg, Mechelen's Erwin Koeman and Ajax's Arnold Muhren and Jan Wouters. Up front was the great Marco Van Basten. As hosts West Germany had not had to qualify. The team was still managed by the legendary Franz Beckenbauer, who had taken them to the World Cup final of 1986 with strength and at times cynical play. Still, the side had a hugely talented generation. A strong defense with Uerdingen's Mathiass Herget, Werder Brehme's Uli Borowka, and two of the world's best defenders, FC Cologne's Jurgen Kohler and Bayern Munich's Andreas Brehme stood in front of the Stuttgart goalkeeper Eike Immel. In midfield was the team captain and general, Lothar Matthaus from Bayern Munich. Along him he had the young Olaf Thon from Schalke 04, Leverkusen's Wolfgang Rolf, and then a strong attack with Borussia Dortmund's Frank Mill, Stuttgart's young supertalent Jurgen Klinsmann and the experienced and dangerous Rudi Voller from AS Roma. West Germany won their group with a tie against Italy and victories over Denmark and Spain, and awaited to face the Netherlands in the semi-finals. The Dutch had developed a hateful rivalry to the Germans. In 1974, when West Germany took the World Cup title against the Dutch in the final, this hate had resonated throughout the match, as memories of WWII were evoked again and again. The Dutch saw themselves as the small and beautiful, facing the mighty and evil Germans. After 1974 this rivalry had become more and more acute, and for the Netherlands it was seen as almost more than a football match. As the Dutch coach had said: “Football is war”. The first half was somewhat of a footballing disappointment. Both teams seemed overly cautious, and chances were few and limited. But at the same time there was an enormous intensity, and the individual duels were dramatic. For instance Frank Riijkaard and Rudi Voller, or Jurgen Kohler and Marco Van Basten, all fought hard in direct confrontations, sometimes going beyond fair play. Ten minutes into the second half came the first goal. Jurgen Klinsmann made it into the area where he was tackled by Frank Riijkaard. Klinsmann was clearly going for the foul as Riijkaard touched him only lightly, but the Romanian referee gave the penalty to the home team amid massive Dutch protests. It had been a clear dive by Klinsmann. Lothar Matthaus made it 1-0 for West Germany. Perhaps it was as compensation for the first penalty that the Netherlands got a penalty 20 minutes later. Marco Van Basten, who had been dangerous the entire match elegantly fought himself into the area, where he was tackled by Jurgen Kohler. Kohler barely touched the ball, but Van Basten, as Klinsmann, fell easily, although not as theatrically. The hard-hitting Ronald Koeman shot the penalty and made it 1-1. With few open chances and two strong defences, most people were getting ready for extra time when Marco Van Basten scored one of the most memorable goals in Dutch football history. Jan Wouters kicked a through-ball towards Marco Van Basten, who rushed into the area after the ball in close contact with Jurgen Kohler. Just as it seemed the ball was getting away Marco Van Basten slid down and more tackled than kicked the ball towards the far corner out of range of a surprised Eike Immel. 2-1 and the Netherlands were in the final, and the country exploded into celebrations that had not been seen since the end of WWII. As if they had taken the title itself. Of course they did go on to win the Euro, defeating the USSR 2-0 in the final. Only two years after this match West Germany defeated the Netherlands in the World Cup quarterfinals and went on to take the world title. This match exorcised much of the Dutch complex about the Germans and WWII, but the rivalry has continued as intense as ever. The Champions League last-16 match between Bayern Munich and Juventus was epic. Both teams showed that the Champions League will be much poorer without one of them, and that both teams, besides superior technical and tactical skills, have stamina and will. Juventus were splendid as they went ahead 0-2 (just as Bayern had done in Turin, before Juventus equalized), and particularly the second goal, with Morata's run and Cuadrado's cool finish, was fantastic. But 0-2 down, Bayern Munich are still never beaten, and it took two headers by Lewandowski and Muller, in the last minute of the match, to take the match into extra time. While cruel indeed to the Italians, it remained an admirable comeback by the Germans. In extra time the changes of Pep Guardiola made the difference, Thiago Alcantara and Kingsley Coman (who is on loan from Juventus) made it 4-2 and put Bayern Munich in the quarterfinals. It was the kind of matches that made my day; made my week in my boring life! The Republic of Ireland had always been midgets of European football. Although not part of the British Empire, its status was often compared to that of the British footballing nations, Northern Ireland, Scotland, England and Wales all had participated in World Cups and were considered strong contenders. This was all the more noteworthy when many Irish players were professionals in the strong English and Scottish leagues, where some clubs had distinctive Irish symbols. Glasgow Celtic for instance, where three Irish players came from: the goalkeeper Pat Bonner, and the experienced defenders Mick McCarthy and Chris Morris. Three players were stars in one of England's best clubs, Liverpool, namely Ronnie Wheelan, John Aldridge and Ray Houghton, while another three played in a club that was known for its Irish players, Manchester United: Kevin Moran, Paul McGrath and Liam O'Brien. The team captain was the Derby County veteran Frank Stapleton. Given that these players played top level football in England, it seemed somewhat strange that England so greatly seemed to underestimate Ireland. In when you added to this that Ireland was coached by one of the greatest players England had ever produced, Jackie Charlton, England should expect a difficult match. England indeed had one of the best generations it had produced for a long time. In 1986 they had made it to the World Cup quarterfinals, only to be eliminated by the ingenuity and brilliance of Diego Maradona. Up front England had a powerful duo with the top-scorer of the 1986 World Cup, FC Barcelona's Gary Lineker together with Liverpool's Peter Beardsley, and right behind them the magnificent John Barnes, also from Liverpool. The veteran Peter Shilton from Derby County guarded the goal, while the veteran from Manchester United, Bryan Robson, was the team captain. The side also included the legendary Glenn Hoddle from AS Monaco, one of the most gifted players of that generation. English football in the 1980s had nevertheless been tarnished by hooliganism. After the tragedy at Heysel in 1985, English clubs had been banned from playing in Europe. Still, the national team continued to attract hordes of beasts, and England games were considered high security risk. All English matches in 1988 were also considered as such. Ireland had qualified the tournament just ahead of Bulgaria, and it was the first time ever that the Republic of Ireland participated in a major tournament. It thus seemed so much noteworthy that they would face their historical rival, England. England had not had much difficulty qualifying ahead of Yugoslavia, Northern Ireland and Turkey, and it was, as always, a team full of expectations of glory that went into the tournament. England was a bit weakened going into the match as their experienced central defender Terry Butcher suffered an injury and had to be replaced by the young Mark Wright from Derby County. After only six minutes the English central defense, unable to get the ball away, conceded Ireland's first goal: Kevin Moran kicked a high ball towards the right side of the English penalty area. Tony Galvin put in a cross that an English central defender just managed to shoot up in the air. John Aldridge headed the ball coming down to Ray Houghton who completely unmarked headed the ball into goal for a very unexpected Irish lead. England seemed in shock, and produced nothing in the first half, as Ireland waited for the English to attack. In the second half England started putting more pressure, but the biggest chance came to the Irish when Ronnie Wheelan had an excellent volley shot that hit the English crossbar. With England putting more pressure Pat Bonner stepped into the match when his hard-fighting defense was beaten: twice he saved shots from Gary Lineker who had gotten through, and he also had an outstanding save on a shot by Bryan Robson. But as most fans watching, it seemed like the Irish more and more believed that this would be their game, and in the end it was a deserved and hard-fought victory for the side's debut in a major tournament. France had nearly the perfect championship in 1984 when they won the tournament at home – the first major tournament France ever won. They had also been huge favourites when entering the tournament given their team of superstars that had made it to the semifinals of the 1982 world cup. The undisputed superstar of the team was Michel Platini from Juventus, who led a midfield that had become known as the “magic square”, with Alain Giresse and Jean Tigana from Bordeaux, as well as Luis Fernandez from Paris Saint Germain. It was a fantastic side that had opened the tournament with three straight wins against Denmark, Belgium and Yugoslavia. And Platini had been unstoppable with seven goals in the first three matches. In the semi-finals the French ran into their first trouble when Portugal led them 2-1 in extra time, but two late strikers by Toulouse's Jean Francois Domergue and Platini (who else?) put them in the final against Spain. Spain had always been the unfulfilled giant in European football. With one of the greatest clubs in the world in Real Madrid, the national side had nevertheless always underperformed, perhaps due to the enormous rivalry between Real Madrid and the Catalonian side FC Barcelona. In 1982 Spain had hosted the world cup and expectations had been enormous, but Spain had in spite of home support and a strong side only made it to the second round after embarrassing results against Honduras and Northern Ireland. The Spanish team was captained by Real Sociedad's goalkeeper Luis Arconada, and was a combination of players from the three strongest Spanish teams (Real Madrid, FC Barcelona and Athletic Bilbao), complemented by six more sides. It seemed like a good balance for the legendary coach Miguel Munoz. Spain had qualified somewhat sensationally. Because of scoring difference they needed to win their final game by a margin of 11 goals against Malta. Spain won 12-1, and made it to the tournament ahead of the Netherlands. To make it to the semi-finals they had won their group ahead of Portugal when, in their last match against West Germany, Sporting Gijon's Antonio Maceda gave them the winning goal in the last minute of the match. In the semi-final they had also fought hard to defeat Denmark by penalties, but still making it to the final. In Paris France seemed completely unbeatable, but the difficulties that Portugal had given the French gave the Spanish some hope. Although dominating the not very memorable first half, France had no clear chances. On the other hand, Real Madrid's Santillana had a header which was cleared on the line. But twelve minutes into the second half whatever meager hopes Spain may have harboured were crushed. Michel Platini took a free kick outside the area. Not a particularly hard free kick, but the ball somewhat slipped under Luis Arconada's hands and into the goal. With such a gift by their captain, Spain was completely broken. It was Michel's Platini's ninth goal of the tournament in five matches. A historic record. Although France had everything under control, Spain had to try to push forward but to no avail. In the last minute of the match the AS Monaco striker Bruno Bellone got through in a counter-attack and alone with Arconada sealed the victory for France. France were deserved and uncontested champions of Europe and Michel Platini was the king who would be named world player of the year. During the 1960s and 1970s French football had gone into decline, but in 1976 Michel Hidalgo became national team coach, and he began building up a team around one of the most talented generations ever in French football. In the 1982 World Cup they played fantastic football and made it to a semi-final against West Germany which remains one of the most dramatic matches in World Cup history. As hosts of the European Championship of 1984 they did not have to qualify, and were huge favourites to win the tournament. The undisputed star of the team was Michel Platini from Juventus, European footballer of the year in 1983, and soon to become the same in 1984 and 1985. But other brilliant players complemented him: Alain Giresse and Jean Tigana from Bordeaux, were generally considered two of the best midfielders in the world, and along with Platini and Luis Fernandez from Paris Saint Germain, they formed what was considered “the magic square”, the best midfield in the world at the time. On goal, Joel Bats from Auxerre was a solid goalkeeper behind a defense with strong players such as Patrick Battiston from Bordeaux, Maxime Bossis from Nantes and Manuel Amoros from Monaco. Up front the players that had the luxury of benefitting from the “Magic Square” were Bordeaux's Bernard Lacombe or Monaco's Bernard Genghini. They had been awesome during the tournament: three victories in the first round against Denmark, Belgium and Yugoslavia put them up as huge favourites in the semifinals where they would meet Portugal, who was somewhat of a surprise in their first semifinals in the first European Championship ever. Portugal had not done any great things since the 1966 World Cup, but had built up a side that would also make it to the World Cup of 1986, and this 1984 Euro was their first. They entered the tournament without huge expectations although everyone had noted that they in qualification had eliminated Poland (1982 World Cup bronze winners) and the USSR. In a group with West Germany, Spain, and Romania, Portugal surprised again: they opened with 0-0 against the Germans and then tied Spain 1-1. A 1-0 victory against Romania was enough to put them in the semifinals. The Portuguese side was formed purely of players from the country's two big sides, Benfica and FC Porto, except for the veteran striker from Sporting Lisbon, Rui Jordao, who was also one of he most important players on the team alongside the Benfica striker Diamantino. The star of the team was Fernando Chalana from Benfica, still considered one of the greatest Portuguese players of all time and the leading midfield general of the Portuguese. The side was captained by the experienced Benfica goalkeeper Manuel Bento. As hosts of the tournament France were the undoubted favourites against Portugal, and many considered that the semifinal would be a walkover on the way to the final, but the Portuguese wanted it differently in what would become one of the greatest matches in European Championship history. In first half things seemed to go as planned for the French who were dominant. After 24 minutes Michel Platini was fouled outside the area, a place where the Frenchman was an expert free kick taker. However, it was not him who scored, it was Toulouse's Jean Francois Domergue. The only consolation from the first half for the Portuguese was that they were only 1-0 down. In the second half they improved, but France still dominated, but without being able to pass Bento to score a decisive goal. Instead, as often happens in football, Portugal equalised when Jordao scored his first goal of the tournament on a header after a perfect cross by Chalana. This seemed to give the Portuguese renewed heart, but it was Bento who again made a spectacular double save that led to a tie and extra time. It was now Portugal who seemed to have more energy, and eight minutes into extra time Chalana dribbled elegantly on the right side, made a cross into the French penalty box where Jordao on the far side volleyed the ball into an unlikely Portuguese lead. Time seemed to move slower for Portugal from that moment, as France put everything into attack. Five minutes before the end Domergue equalised for France when receiving a ball that the Portuguese had been unable to clear. And just one minute from the end Portuguese dreams of a surprise were shattered when Jean Tigana ran through a Portuguese defense, and from the back line centered into an unmarked Michel Platini, who was as cool as an ice-cube when stopping the ball and placing it hard behind struggling Portuguese defenders. Michel Platini's eighth goal of the tournament and surely his most important, as it put France in a final that they would end up defeating Spain in. This was perhaps the best match in European Championship history. 1980 was the year when the European championship changed structure. A final round of eight teams was introduced, to be preceded by a qualification. The eight teams would be divided into two groups where the winners would go directly to the final and the runner-ups would be playing for third place. Italy was selected as host, qualifying automatically as such. After losing the 1976 final West Germany had undergone a generation shift from the World Cup side of 1974. Legends such as Franz Beckenbauer, Sepp Maier, Berti Vogts or Uli Hoeness had retired, but had been replaced by another generation players. The side was much more varied in terms of clubs as Bayern Munich's and Borussia Monchengladbach's stars had faded, but the players were not less talented and would leave a mark on German football. On goal was FC Cologne's Harald Schumacher, a hugely talented but controversial goalkeeper. The captain of the team was the MSV Duisburg defender Bernard Dietz, complemented by Real Madrid's Uli Stielike, VFB Stutgart's Karl-Heinz Forster, as wel as the Hamburg SV legend Manfred Kaltz. The soon to be FC Barcelona player Bernd Schuster played in midfield with Kaiserslautern's Hans Peter Briegel and Bayern Munich's Karl-Heinz Rummennigge, with FC Cologne's Klaus Allofs. Just before the tournament the bicycle-kick expert from Schalke 04 was injured and was replaced by Hamburg SV's Horst Hrubesch. Hrubesh, a sturdy attacker who had only made it to the national team at the age of 28 was not immediately seen as the best replacement for Fischer, but would go into the history books. West Germany, runner-ups in 1976, were paired in group A with the defending champions of Czechoslovakia and in the opening match of the tournament the Germans got revenge for their defeat four years before by winning 1-0 on a goal by Karl-Heinz Rummenigge, who would go on to be the European player of the year of 1980 (ahead of his teammate Bernd Schuster). In their second match against the Netherlands West Germany won 3-2 with three goals by Klaus Allofs, and 0-0 in their last match against Greece was enough to take them to the final. Belgium had not been a great footballing power in Europe, but by 1980 the team had developed one of its most talented generations under the most legendary of Belgian coaches, Guy Thys. On goal was Beveren's Jean-Marie Pfaff, behind Standard Liege's Eric Gerets and Michel Renquin in defense. The team captain was Beerschot VAC's Julien Cools, complemented in midfield by Club Brugge's Rene Vandereycken and the K.Beringen veteran Wilfried Van Moer. Up front Anderlecht's Francois Van der Elst and Club Brugge's Jan Ceulemans formed the attacking duo. Belgium had qualified the tournament ahead of Austria, Portugal and Scotland, but were not considered as prime contenders in a group with England, Spain, and the home side of Italy. But after opening with 1-1 against England, Belgium defeated Spain 2-1, and a 0-0 in their last match against Italy was enough to put them in their first international final ever. But there was no doubt that West Germany were the favourites against little Belgium, and when the game started the Germans were ready to take up their role as favourites, and put strong pressure on the Belgians. Bernd Schuster had a good attempt from long-range that was well saved by Pfaff, and in the 10th minute the Barcelona player lifted the ball above a Belgian defender to Horst Hrubesch at the edge of the Belgian area. Hrubesch, who had been criticized for his lack of goals in the tournament, in one movement took the ball down with his breast and hammered to the ball with his right foot, scoring a great opener for West Germany. Rummenigge, Schuster & Co continued pressuring for the remainder of the first half and should perhaps have been ahead by more than 1-0 by the time the second half started. But it was then Belgium, who until then had been mere spectators, showed why they had made it to the final. Led by the veteran Van Moer, the Belgians fought themselves back into the match and neutralized the powerful German midfield. In the 75th minute they were rewarded: on an excellent pass by Jan Ceulemans Francois Van er Elst got through alone against Schumacher, but an onrushing Uli Stielike tackled and committed a clear penalty (today Stielike would undoubtedly have been given a red card). Rene Vandereycken converted the penalty and made it 1-1. Most spectators, except the Germans, were now supporting the Belgians, who seemed to have the ipper hand. But in the 86th minute Karl-Heinz Rummennigge took a corner kick. It went to the central part of the Belgian area where Horst Hrubesch rose above a shaky-looking Jean-Marie Pfaff, and headed the ball into goal. Horst Hrubesch, the substitute striker from Hamburg had become the hero of the day. This was enough for West Germany, who after a few years of a bit of decline were back at the top of European football with a team that would remain at the top of world football during the 1980s. Belgium, the major surprise of the tournament would also remain a powerful player in world football, culminating with a semi-final spot at the 1986 World Cup.